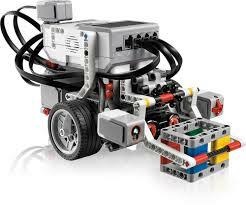 In this course, the kids will learn more advanced techniques for programming and building with Lego Robots. The focus of this class is creating reusable modules. For the programming side, they will create reusable macros to complete common tasks. This approach is similar to writing macros for Excel to increase your productivity with a spreadsheet. They will also be applying simple math formulas to more accurately interpret sensor values (eg. smooth light followers).to on implementing their ideas, troubleshooting any problems, and then making improvements. The kids should be coming up with their own ideas for completing the task. In other words, besides the building the initial robot, there are purposefully not a lot of examples. For the building side, they will be learning about reusable assemblies that can be attached to a motor. Since our robots will only have one utility motor, the kids will learn various methods to connect attachments so they can switch from a "grabber" to a "dumper" in seconds. They will also learn techniques for creating some commonly used non-motorized attachments. This class is typically offered during winter term for 4th and 5th graders in Sherwood. NOTE: Although the first Robotics class is not a required prerequisite, it does provide a good foundation for this material. During the first week of this course, we will be reviewing the programming basics that were presented in the first course. ​Click Here for class registration information.